Cannot be Normal Summoned/Set. Must be Special Summoned (from your hand) by having exactly 5 WATER monsters in your Graveyard, and cannot be Special Summoned by other ways. When this card is Special Summoned: Discard 2 random cards from your opponent’s hand (or their entire hand, if less than 2). You can only use the effect of “Moulinglacia the Elemental Lord” once per turn. If this card leaves the field, skip the Battle Phase of your next turn. Elemental Lord week on Pojo continues with Moulinglacia the Elemental Lord. WATER-based Elemental Lord, Moulinglacia needs exactly 5 WATER monsters like all Elemental Lords need for their specific Attribute. Restriction on other ways of Special Summoning Moulinglacia hurt its playability, since once it’s dead, it’s dead unless you get it back to the hand. Skipping the next Battle Phase if Moulinglacia leaves the field hurts, but you can balance it out with Soul Charge or a card effect that forces you to skip your Battle Phase. A discard of two from your opponents hand is okay, but many decks use their grave, and this would supply them with resources there, yet deplete their hand resources at the same time. Against certain decks this is a great effect. Pendulum decks this hurts greatly, stopping them from recycling back into the Extra Deck, as well as hurting the Trickstar archetype. Decks like Shaddoll and Burning Abyss get helped by this effect, and SPYRAL can play around this effect. For needing a grave-specific requirement of monsters 2800 is okay attack to have, and it is Trade-In fodder. Dropped into Mermail, this could actually be a good card to use. Combined with Abyssleed, you will be discarding 3 cards from your opponents hand, 3 out of 5 cards in their opening hand if you can somehow flood your grave during your first turn and drop both these. A decent card with great support being this. WATER-based decks could get this out pretty easily while not sacrificing field and hand presence. I say give it a try. We continue with the Elemental Lords by looking at one of the more popular ones, Moulinglacia the Elemental Lord. Moulinglacia is a Level 8 Water Sea Serpent with 2800 ATK and 2200 DEF. Stats are once again solid, Level is fine, Water is well supported, and Sea Serpent usually goes with Aqua or Fish support 90% of the time. Like the other Lords, Moulinglacia needs exactly 5 Water monsters in the GY to summon. 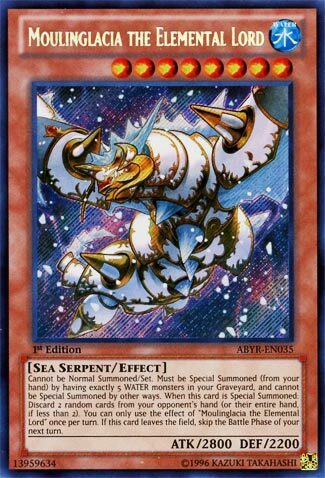 Mermail Atlanteans (the best Water deck in my opinion) can easily set up the GY with certain 2 or 3 card combos, though I cannot mention them off the top of my head. When summoned, you can take two cards out of your opponents hand, or their whole hand if less than two. Basically a Delinquent Duo, but stronger because you can actually make your opponent ditch a card if they only have one, and they don’t get to chose. Moulinglacia is a hard once per turn thankfully, because I hate hand loops. Also has the Elemental Lord clause. One of the more popular Lords for a reason, Water has the best GY control out of the four attributes that currently have Elemental Lords, though Light and I presume Dark are coming. Play it in the Mermail Atlantean deck, or any Water deck you wish to play it in. I will say now, though, I think all of the Elemental Lords are best as 1 ofs if you do play them, except in the Elementsaber deck mentioned yesterday because they can always change their attributes in the GY.